© Basir et al. ; Licensee Bentham Open. Tooth restoration immediately after bleaching is challenging due to the potential problems in achieving adequate bond strength. The aim of this study was to evaluate the effect of surface treatment with ER:YAG, ND:YAG, CO2 lasers and 10% sodium ascorbate solution on immediate microtensile bond strength of composite resin to recently bleached enamel. Ninety sound molar teeth were randomly divided into three main groups (n:30) : NB (without bleaching), HB (bleached with 38% carbamide peroxide) and OB (bleached with Heydent bleaching gel assisted by diode laser). Each group was divided into five subgroups (n:6) : Si (without surface treatment), Er (Er:YAG laser), CO2 (CO2 laser), Nd (Nd:YAG laser) and As (Immersion in 10% sodium ascorbate solution). The bonding system was then applied and composite build-ups were constructed. The teeth were sectioned by low speed saw to obtain enamel- resin sticks and submitted to microtensile bond testing. Statistical analyses were done using two- way ANOVA, Tukey and Tamhane tests. µTBS of bleached teeth irradiated with ND:YAG laser was not significantly different from NB-Nd group. Microtensile bond strength of OB-Er group was higher than NB-Er and HB-Er groups. The mean µTBS of HB-CO2 group was higher than NB-CO2 group; the average µTBS of HB-As and OB-As groups was also higher than NB-As group. Use of Nd:YAG, CO2 lasers and 10% sodium ascorbate solution could improve the bond strength in home-bleached specimens. Application of ND:YAG laser on nonbleached specimens and Er:YAG laser on office-bleached specimens led to the highest µTBS in comparison to other surface treatments in each main group. Keywords: Bleaching, CO2 laser, Er:YAG laser, microtensile bond strength, Nd:YAG laser, sodium ascorbate. Esthetic dentistry is usually a combination of bleaching treatment and subsequent tooth-colored restorations . A reduction in bond strength of adhesive restorations to enamel and dentin immediately after bleaching has been reported in the literature [2-4]. It appears that oxygen free radicals present in tooth structure prevent the polymerization of adhesives and composite resins . Also, bleaching causes morphological alterations in enamel and dentin that include loss of calcium and phosphate, loss of prismatic enamel structure, destruction of organic matrix and accumulation of oxygen in dentin . Therefore, textbooks recommend a one to two week interval between the bleaching and restorative treatments in order to obtain adequate bond strength [7, 8]. This time interval prolongs the course of treatment and increases the risk of crown fracture, microleakage and secondary discoloration in cases with intracoronal bleaching. These complications are unfavorable to both the patient and dentist . Antioxidant agents such as 10% sodium ascorbate and catalase enzyme have been used to reverse this process. However, these agents are not routinely used in the clinical procedures [10, 11]. Appearance of new technologies such as laser beams has been associated with undeniable benefits in dentistry. ND:YAG and Er:YAG lasers are used in operative dentistry for the removal of carious lesion, conditioning of tooth surfaces and enamel and dentin surface treatment in order to minimize marginal microleakage and increase the bond strength [11-15]. Enamel is a solid opaque substance with the ability to absorb CO2 laser beams. Physical changes due to the irradiation of this type of laser include melting and recrystallization . Considering the ablative effect of Er:YAG laser on tooth structure and the recrystallization effect of ND:YAG and CO2 lasers, it seems that application of these lasers after tooth bleaching can cause a temperature rise in tooth structure and subsequent morphological changes in enamel and dentin leading to the elimination of remaining free radicals and rapid neutralization of the adverse effects of bleaching agents on bond strength [11, 17]. Due to the lack of adequate information on this subject, controversial results obtained by previous studies and scarce data on the effect of CO2 laser in this respect, the aim of the present study was to evaluate the effects of ND:YAG, Er:YAG and CO2 lasers on microtensile bond strength of recently bleached enamel to composite resin and comparison of the obtained results with the conventional method of 10% sodium ascorbate (antioxidant) application. A total of 90 extracted human third molars with no fracture or carious lesions were used in this study. Organic debris and tissue remnants were removed prior to the study using periodontal scaler. Prophylaxis was done with the fluoride-free pumice and rubber cup. The teeth were disinfected with 0.5% chloramine solution (Chloramine T Trihydrate, Merck, Schuchardt, Germany) for one week and stored in distilled water at 4˚C until one week prior to the test and then immersed in artificial saliva (ISO/TS 11405) and stored in an incubator (Kavoosh MEGA ,Tehran, Iran) at 37°C until testing. The composition of artificial saliva was 1.5 mmol/L Ca+2, 50 mmol/L KCl, 0.9 mmol/L PO4-3, and 20 mmol/L Trihydroxy methylaminomethane, with a pH of 7.0. The artificial saliva was refreshed daily. It was saturated with calcium and phosphate ions similar to the composition of human saliva . The teeth were evaluated under stereomicroscope (Nikon C-DS, Tokyo, Japan) at 50X magnification for exclusion of samples with cracks or hypoplastic lesions. In order to standardize the texture of the surface and smear layer, buccal surfaces of teeth were ground by 600 grit silicon carbide sandpapers for 60 seconds under running water (ISO/TS 11405). Samples were randomly divided into three main groups of 30 samples each based on the type of bleaching treatment (Home or Office) and the third group was considered as the control group and did not undergo bleaching. Each group was categorized into 5 subgroups of 6 specimens each to provide totals 270 stick samples for microtensile bond strength test. This implies n=18 for each group (Table 1). Specimens in this group did not undergo bleaching treatment and stored in distilled water at 4°C and then immersed in artificial saliva one week before the bonding procedure. Home bleaching was carried out using 38% carbamide peroxide gel (Discus Dental, CA, USA) applied in 2 mm thickness on tooth surfaces for 15 minutes. The teeth were placed in Petri dish containing artificial saliva in a way that their buccal halves were out of the saliva and in contact with the gel. Petri dishes were stored in an incubator at 37°C for 15 minutes. The gel was then washed off the teeth and the abovementioned procedures were repeated. Therefore, the teeth were bleached for a total of 30 minutes, according to manufacturer’s instructions. After completion of the mentioned 30 minute period, the teeth were placed in a test tube containing 14 ml of artificial saliva and stored in an incubator at 37°C. Artificial saliva was refreshed daily and the whole duration of treatment was three weeks. Office bleaching was done using Heydent JW Power Bleaching Gel (Production of Farafan Diagnostics Co , under license of Heydent, Germany Tehran- Iran) in two treatment sessions. Each session included three times application of gel. JW Powder was mixed with 30% hydrogen peroxide. The prepared gel was then applied to tooth surfaces in 1.5 mm thickness and activated with CHEESE ™ (Wuhan Gigaa Optronics Technology Co, LTD, China) 810 nm diode laser in continuous mode with power of 1W, exposure time of 30 seconds and irradiation distance of 6 mm from the gel surface. Gel was remained on tooth surfaces for one minute. During this time period, the teeth were maintained in the Petri dish containing artificial saliva in a way that their buccal halves were out of the saliva and in contact with gel. Petri dishes were placed in an incubator at 37°C. The gel was then washed off the tooth surfaces. This process was repeated three times. The teeth were then rinsed, placed in a test tube containing 14 ml of artificial saliva and stored in an incubator at 37°C. Artificial saliva was refreshed daily. The second session was scheduled one week later during which the abovementioned procedures were repeated. The experimental groups included three main groups with 5 different surface treatments. In total, the experiment was conducted on 15 experimental groups based on the type of bleaching and surface treatment method. Groups 1, 6 and 11 (Si): No surface treatment performed. Groups 2, 7 and 12 (As): 10 ml of 10% sodium ascorbate solution was poured on tooth surfaces at a speed of 1 ml/min. This solution was agitated to enamel surfaces continuously for 10 minutes and then rinsed with distilled water and air-dried. Groups 3, 8 and 13 (Er): Irradiation with Er:YAG laser (USD20, DEKA Dental laser systems, Florence, Italy) with energy of 50 mJ, frequency of 10 Hz and power of 0.5 W, pulse duration of 230 µs (very short pulse) and non-contact mode at distance of 4 mm that provides 1 mm beam diameter. In order to standardize the 4 mm irradiation distance between the laser hand piece and the respective surface, an endodontic k-file was fixed to the hand piece. All the area of enamel was irradiated uniformly by hand in grid pattern by a single operator for 60 sec. Groups 4, 9 and 14 (Nd): Irradiation with Nd:YAG laser (FIDELIS, Fotona , Slovenia) using power of 1 W, frequency 10 Hz, pulse duration : 100 μS (very short pulse) and contact mode in grid pattern via a 300 μm fiber optic cable by single operator manually for 60 sec. Groups 5, 10 and 15 (CO2): Irradiation with CO2 laser (US- 20D , DEKA Dental laser systems, Florence, Italy) at power of 0.5 W, frequency 10 Hz, pulse duration of 1.5 ms, non-contact mode at distance of 12.5 mm providing beam diameter of 1 mm manually by one operator in grid pattern for 60 sec. The fiber optic cable in this type of laser has an outer sheath that keeps a 12.5 mm distance from the respective area. Before the bonding procedure, one sample from each group was selected for evaluation of surface alterations by FESEM (S4160 Hitachi, Japan). Sample preparation for electron microscopic evaluation included fixation, dehydration, chemical drying and gold coating. After these treatments, the bonding system was used according to the manufacturer’s instructions. All the specimens were etched with 35% phosphoric acid (Scotch Bond Etchant, 3MESPE, St. Paul, MN, USA) for 15 s, rinsed for 10 s and air dried for 5 s with air spray. Adper Single Bond 2 adhesive (3MESPE , St. Paul , MN , USA) was applied in two coats and air-dried for 5 s with compressed air in order for the solvent to vaporize and cured for 10 s with LED light curing unit (800 mW/cm2) (DEMI, Kerr, Ca, USA). Z250 composite resin was applied in two layers to the entire buccal surface. Each layer was cured for 20 s with the LED light-curing unit. Finally, the composite build-up was cured for 100 s from different directions. After the bonding procedure, samples were stored in artificial saliva in an incubator at 37°C for 24 hours. The teeth were then embedded in auto-polymerizing acrylic resin (Meliodent, Heraeuse Kulzer, Germany) and sectioned in X and Y directions with a slow speed diamond saw (Mecatome, T201A, France) along with water coolant. Three rectangular-shaped enamel-resin sticks were obtained from each tooth as such with a mean cross section of 1 mm2. A digital caliper to the nearest 0.01 mm (Mitutoyo, Tokyo, Japan) was used for the accurate measurement of the dimensions of sticks. In general, 18 sticks in each experimental group and a total of 270 sticks in 15 experimental groups were prepared. Sticks were attached to a microtensile tester (Microtensile Tester, Bisco, Schaumburg, IL, USA) using cyanoacrylate glue (Mitreaple, Turkey) and subjected to microtensile testing at a crosshead speed of 1 mm/min. Microtensile bond strength in MPa was calculated by dividing the exerted force in Newton at the time of fracture by the cross sectional area of enamel/resin interface in mm2 measured before the failure. Adhesive failure: Fracture at the tooth/adhesive or composite/adhesive interface in more than 75% of the understudy areas. Cohesive failure in resin: This fracture occurs mainly in the composite resin in a way that more than 75% of the bonding area has been covered with the restorative material. Cohesive failure in tooth: Fracture mainly occurs in the tooth structure. Mixed failure: Mixed fracture is a combination of the abovementioned fractures. The prematurely debonded specimens were included in the tooth mean and microtensile bond strength of these samples was considered zero. Data obtained from microtensile bond strength testing were analyzed using portable SPSS PASW 18 software. Considering the normal distribution of data, two-way ANOVA was applied to assess the interaction of the effect of bleaching with type of surface treatment. P<0.05 was considered statistically significant. Since the abovementioned interaction was statistically significant, one-way ANOVA was used with the significance level of 0.05. For pair wise comparison, in case of equality of variances Tukey’s HSD test and in case of inequality of variances, Tamhane’s test was performed. Two-way ANOVA demonstrated that the interaction between the two variables (bleaching and type of surface treatment) was statistically significant (P<0.001). Data in each group was subjected to one-way ANOVA based on the type of bleaching and surface treatment (α=0.05). One-way ANOVA failed to show a statistically significant difference in mean microtensile bond strength of HB-Si and OB-Si with NB-Si group (P=0.59)(P=0.52). One-way ANOVA could not find a significant difference in mean microtensile bond strength of HB-Nd and OB-Nd with NB-Nd group (P=0.142). Significant differences were found in mean microtensile bond strengths of OB-Er, HB-Er and NB-Er groups using one-way ANOVA (P<0.001). Tamhane’s test revealed that the mean bond strength of samples subjected to office bleaching and irradiation of Er:YAG laser was higher than that of samples undergone home bleaching and Er:YAG laser irradiation and also nonbleached samples receiving Er:YAG laser treatment (P<0.001); but, the mean bond strength was not significantly different in HB-Er and NB-Er groups (P=0.228). One-way ANOVA found a significant difference in mean bond strength of OB-CO2, HB-CO2 and NB-CO2 groups (P=0.018). Tamhane’s test indicated that the mean bond strength of samples subjected to home bleaching and CO2 laser irradiation was higher than that of nonbleached samples receiving CO2 laser treatment (P=0.003). However, No significant difference was detected in this respect between the OB-CO2 and HB-CO2 groups (P=0.992). The bond strengths in OB-CO2 and NB-CO2 groups were not significantly different either (P=0.084). Significant differences were also detected in mean microtensile bond strength of HB-As, OB-As and NB-As groups using one-way ANOVA (P=0.010). Tamhane’s test revealed that the mean bond strength after bleaching (home or office) and application of sodium ascorbate was higher than that of nonbleached samples with sodium ascorbate surface treatment (P<0.005). However, no significant difference was detected in mean bond strength of HB-As and OB-As groups (P=0.896). One-way ANOVA found significant differences in mean microtensile bond strength of NB-Si, NB-Er, NB-CO2, NB-Nd and NB-As groups (P<0.001). Tukey’s HSD test showed that ND:YAG laser causes significantly higher bond strength in control (nonbleached) samples. Significant differences were also found in mean microtensile bond strength of HB-Si, HB-Er, HB-CO2, HB-Nd and HB-As groups using one-way ANOVA (P<0.001). Tukey’s HSD test revealed higher mean microtensile bond strength in samples subjected to home bleaching and sodium ascorbate application, ND:YAG laser irradiation and CO2 laser irradiation compared to specimens with no surface treatment. One-way ANOVA found statistically significant differences in mean microtensile bond strength of OB-As, OB-Nd, OB-CO2, OB-Er and OB-Si groups (P=0.001). 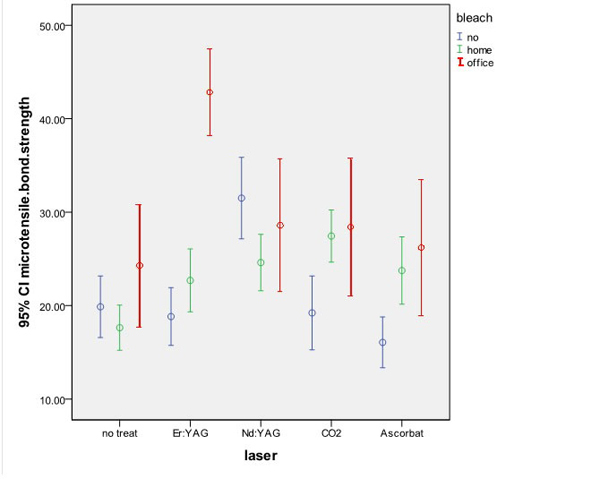 Tukey’s HSD test revealed higher mean bond strength in samples subjected to office bleaching and Er:YAG laser irradiation compared to other subgroups (no surface treatment, ND:YAG laser, CO2 laser and sodium ascorbate). Results of the statistical analysis with one way ANOVA, Tamhane’s and Tukey’s HSD tests are displayed in Fig. (1). In many cases, the patient needs other esthetic treatments such as composite veneers following the bleaching treatment. However, tooth restoration immediately after bleaching is challenging due to the potential problems in achieving adequate bond strength . Oxygen free radicals, lower mineral content and changed enamel organic matrix following bleaching may interfere with the photopolymerization reaction of resin-based restorative materials resulting in subsequent decrease in resin/tooth bond strength and stability [1, 11]. In the present study, 38% carbamide peroxide and 30% hydrogen peroxide gel were used as bleaching agents. Although 10% carbamide peroxide is a safe and effective bleaching agent, its higher concentrations are now routinely used to obtain faster results . The office bleaching gel used in our study contained 30% hydrogen peroxide along with titanium oxide particles. Titanium dioxide particles (TiO2), as the diode laser energy absorbent, reduce the heat transferred to the pulp and act as catalyst for the production of free radicals from hydrogen peroxide. In other words, these particles lead to the higher production of oxygen free radicals . Use of higher concentrations of carbamide peroxide and subsequent greater production of free radicals by the bleaching gel containing titanium dioxide particles yield faster results. However, this process may be associated with higher prevalence of adverse effects linked to the accumulation of peroxide and may compromise the bond strength. Therefore, in order to witness the effect of bleaching on the composite resin/tooth bond strength, both techniques of office and home bleaching were evaluated. Samples were kept in artificial saliva from one week before the test and during the bleaching treatment. Artificial saliva was refreshed daily. The artificial saliva was saturated with calcium and phosphate ions and had a composition similar to that of natural human saliva . Comparison of microtensile bond strengths of experimental groups. In the present study, bleaching (home and office) could not significantly decrease bond strength in comparison to nonbleached samples, which is in accord with the results of Marcondes et al. in an in vitro study, they evaluated the effect of ND:YAG laser bleaching on tensile bond strength of two types of adhesive systems to bleached enamel. They found no significant difference in bond strength of bleached and nonbleached samples. Gurgan et al. assessed the effect of different adhesive systems and surface treatment with laser on shear bond strength of restorations to bleached enamel and detected no statistically significant difference in shear bond strength of recently bleached samples and those bonded 15 days after bleaching. Immerz et al. evaluated the effect of bleaching on shear bond strength of orthodontic brackets. Despite the significant improvement in color after bleaching, shear bond strength of bleached samples was not significantly different than that of nonbleached specimens. In contrast to the abovementioned findings, Kunt et al. studied the effect of antioxidant treatment on shear bond strength of composite resin to bleached enamel and noticed that the bond strength was significantly lower in bleached samples compared to nonbleached specimens. Such conflicting results may be attributed to different factors such as the concentration of oxygen in enamel and consequent prevention of resin polymerization and change in dental substrate. In other words, organic content of enamel and dentin may act as a source for oxygen release and interfere with the process of polymerization. On the other hand, acidity of bleaching agents leads to the loss of tooth mineral content that may decrease bond strength . Perdigao et al. believed that the reduction in bond strength after bleaching was due to the morphological alterations in proteins and mineral salts and oxygen concentration of the enamel played no role in this regard. It seems that type of bonding system can affect the bond strength after recent bleaching. As mentioned earlier, the bonding system used in this study was Single Bond 2, which is an ethanol-based adhesive. The alcohol content of this adhesive can react with water and oxygen present in superficial enamel layer and neutralize the adverse effects of oxygen molecules retained from the bleaching treatment. This finding is in accord with the results of Syprides et al., and Sung et al., studies [22-24]. Furthermore, Single Bond 2 is an etch and rinse adhesive system and it appears that its acidic pH (0.6), separate application of etching acid and superficial layer removal improved bond strength in bleached samples (both home and office bleaching samples). This result is in agreement with the findings of Khoroushi et al. . They evaluated the effect of an antioxidant application on enamel bond strength of three types of adhesives. Higher shear bond strength values were detected in bleached samples with immediate application of Optibond FL in comparison to Optibond Solo Plus and Optibond All-in-One. They attributed this finding to the low pH of Optibond FL adhesive in comparison to that of the other two adhesives. Gurgan et al. in their study suggested the use of etch and rinse adhesives after bleaching treatment and believed that etch and rinse systems yield higher bond strength compared to self-etch adhesives. In our study, no significant difference was detected in microtensile bond strength of bleached (office/home) and nonbleached (NB) samples receiving ND:YAG laser irradiation and the mean bond strength in the mentioned three groups were within the clinically acceptable range (greater than 20 MPa) . In the NB group, the microtensile bond strength of samples receiving ND:YAG laser irradiation was significantly higher than that of other subgroups (Er:YAG, CO2 laser, sodium ascorbate, no surface treatment) and other subgroups had no significant difference with one another. Torres et al. assessed the effect of surface treatment with ND:YAG and Er:YAG lasers on bond strength of composite resin to bleached enamel. They noticed that ND:YAG laser treatment of unbleached enamel resulted in a lower bond strength compared to the control group without bleaching or surface treatment which is contrast to our study result. However, use of this type of laser on bleached enamel yielded a bond strength value 5 times higher than that of bleached samples without laser treatment . In the present study, microtensile bond strength in home bleached samples receiving ND:YAG laser treatment was significantly higher than that of home bleached specimens without surface treatment. Studies conducted on the application of ND:YAG laser on tooth surfaces have shown its melting and recrystallization properties that are due to its energy density. Morphological alterations in dental substrate as the result of ND:YAG laser irradiation, are based on the amount of calcium and phosphorus loss resulting in subsequent change in organic structure of hydroxyapatite and its consequent recrystallization [17, 26]. Increase in microtensile bond strength of NB-Nd samples may be explained by the fact that recrystallization of hydroxyapatite crystals provides a better adhesion to tooth surface. Improved bond strength in HB-Nd group may be justified by the fact that ND:YAG laser application can reverse the destructing effects of bleaching during the process of melting and recrystallization of enamel. In other words, during this process the surface free radicals may vaporize and peroxide apatite (that forms as the result of replacement of hydroxyl radicals with the peroxide ions in apatite crystals) recrystallizes and forms hydroxyapatite . Results of the present study indicated that application of Er:YAG laser can significantly increase the microtensile bond strength in OB samples compared to NB and HB specimens. Furthermore, in OB-Er group the bond strength was significantly higher that other groups (OB-Si, OB-As, OB-CO2, OB-Nd). No significant difference was found in this respect between other groups. Torres et al. in their study revealed that Er:YAG laser treatment following bleaching can increase the bond strength in comparison to specimens that had undergone bleaching treatment alone. Er:YAG laser with 2.94 μm wavelength has the highest absorption in water. This laser causes micro explosions during the ablation of hard tissue and leads to the development of macroscopic and microscopic roughness. In other words, at first, the laser beam causes the evaporation of water and other hydrated organic components. During the process of evaporation, internal pressure continues to increase until the explosive destruction of mineral components occurs. This reaction occurs before reaching the melting point. This laser causes no or minimal damage to the adjacent tissues and surrounding structures because the main part of energy spreads in the target tissue . Higher microtensile bond strength in OB-Er compared to HB-Er and NB-Er groups can be explained by the fact that in office bleaching group, bleaching treatment was done with the use of 810 nm diode laser and a bleaching gel containing titanium dioxide. Absorbent materials such as TiO2 are able to absorb laser energy and if used in the bleaching gel, the bleaching treatment will be performed more quickly, efficiently and safely . Under such conditions, more free radicals are produced but they are limited to the enamel surface and prevent changes in enamel structure . Thermal effects of ER:YAG laser during the process of vaporization are probably responsible for the ablation of the remainder of oxygen free radicals in the tissue. Additionally, removal of the oxygen-rich superficial enamel layer by the ablation process of ER:YAG laser can also be responsible for the increased bond strength in the office-bleached group. It appears that application of ER:YAG laser after office bleaching increases the bond strength. However, further investigations are required in this respect. In the present study, microtensile bond strength in the HB-CO2 group was significantly higher than in NB-CO2 group. Furthermore, in the HB group, bond strength of bleached samples receiving CO2 laser irradiation was significantly higher than that of bleached specimens with no surface treatment. The CO2 laser energy is well absorbed by the enamel causing physical and chemical changes on the enamel surface . Physical changes caused by the CO2 laser include melting, recrystallization and formation of small bubble-shaped structures . Increased microtensile bond strength of HB-CO2 group can be due to the recrystallization and melting characteristics of this type of laser. The former characteristic probably leads to changes in peroxide apatite crystals formed through the process of bleaching and provides a more optimal surface for adhesion in a way that the bond strength even exceeds that of NB-CO2 group. The latter characteristic eliminates the remaining oxygen in the tissue by raising the surface temperature. Our study results demonstrated that microtensile bond strength of bleached (home, office) specimens subjecting to surface treatment with the application of 10% sodium ascorbate solution was significantly higher than that of unbleached samples receiving the same surface treatment. In the HB group, bond strength of bleached samples receiving sodium ascorbate surface treatment was significantly higher that that of bleached specimens with no surface treatment. Several studies have demonstrated that application of sodium ascorbate as an antioxidant after enamel bleaching can improve the bond strength [5, 30-32]; which, is in concord with our findings. Sodium ascorbate as an antioxidant agent neutralizes the free radicals remained from the process of bleaching during an oxidation-reduction reaction and allows the polymerization of resins. It also prevents the early stop of polymerization reaction [11, 33]. Furthermore, it seems that sodium ascorbate well reacts with the peroxide apatite crystals formed during the process of bleaching and results in a significant increase in bond strength of bleached samples compared to nonbleached specimens receiving ascorbate surface treatment. Overall, the present study results indicate the positive effects of ND:YAG, ER:YAG and CO2 lasers on improving the bond strength in bleached specimens. The effects of these lasers depend on their energy intensity and dosage . Studies conducted on this subject have yielded conflicting results, which are mainly due to the lack of standard parameters for this purpose. Thus, future studies are required to focus on providing standard methods. Within the limitations of this study, it was demonstrated that bleaching did not cause a significant reduction in bond strength. In the control group, ND:YAG laser treatment caused the highest bond strength compared to other surface treatments (ER:YAG laser, CO2 laser, sodium ascorbate and no surface treatment). In the office bleached group, ER:YAG laser application significantly improved the bond strength in comparison to other treatments (ND:YAG laser, CO2 laser, sodium ascorbate and no surface treatment). In the home bleached group, ND:YAG laser, CO2 laser and sodium ascorbate solution equally improved the bond strength. Leonetti EdosS, Rodrigues JA, Reis AF, Navarro RS, Aranha AC, Cassoni A. Microtensile bond strength of resin composite to dentin treated with Er:YAG laser of bleached teeth. Lasers Med Sci 2012; 27(1): 31-8. Titley KC, Torneck CD, Smith DC, Chernecky R, Adibfar A. Scanning electron microscopy observations on the penetration and structure of resin tags in bleached and unbleached bovine enamel. J Endod 1991; 17(2): 72-5. Stokes AN, Hood JA, Dhariwal D, Patel K. Effect of peroxide bleaches on resin-enamel bonds. Quintessence Int 1992; 23(11): 769-71. García-Godoy F, Dodge WW, Donohue M, O’Quinn JA. Composite resin bond strength after enamel bleaching. Oper Dent 1993; 18(4): 144-7. Gurgan S, Alpaslan T, Kiremitci A, Cakir FY, Yazici E, Gorucu J. Effect of different adhesive systems and laser treatment on the shear bond strength of bleached enamel. J Dent 2009; 37(7): 527-34. Güler E, Gönülol N, Özyilmaz ÖY, Yücel AÇ. Effect of sodium ascorbate on the bond strength of silorane and methacrylate composites after vital bleaching. Braz Oral Res 2013; 27(4): 299-304. Heymann HO, Swift JR, Ritter AV. Sturdevant's art and science of operative dentistry. 6th ed. Canada: Elsevier Mosby 2013. Summitt JB, Robbins JW, Hilton TJ, Schwartz RS, Santos JD. Fundamentals of operative dentistry. 3rd ed. China: Quintessence Publishing Co 2006. Goldstein RE. Esthetics in dentistry. 2nd ed. Canada: Bc Decker Inc 1998. Kunt GE, Yılmaz N, Sen S, Dede DÖ. Effect of antioxidant treatment on the shear bond strength of composite resin to bleached enamel. Acta Odontol Scand 2011; 69(5): 287-91. Rocha Gomes TC, Caneppele TM, Del Moral de Lazari R, Ribeiro CF, Borges AB. Effect of dental surface treatment with Nd:YAG and Er:YAG lasers on bond strength of resin composite to recently bleached enamel. Lasers Med Sci 2012; 27(4): 755-60. Ribeiro CF, Anido AA, Rauscher FC, Yui KC, Gonçalves SE. Marginal leakage in class V cavities pretreated with different laser energy densities. Photomed Laser Surg 2005; 23(3): 313-6. Gonçalves SE, de Araujo MA, Damião AJ. Dentin bond strength: influence of laser irradiation, acid etching, and hypermineralization. J Clin Laser Med Surg 1999; 17(2): 77-85. Bertrand MF, Semez G, Leforestier E, Muller-Bolla M, Nammour S, Rocca JP. Er:YAG laser cavity preparation and composite resin bonding with a single-component adhesive system: relationship between shear bond strength and microleakage. Lasers Surg Med 2006; 38(6): 615-23. De Munck J, Van meerbeek B, Yudhira R, Lambrechts P, Vanherle G. Microtensile bond strength of two adhesives to Erbium: YAG Lased vs. bur cut enamel and dentin. Eur J Oral Sci 2002; 110(4): 322-9. Fuhrmann R, Gutknecht N, Magunski A, Lampert F, Diedrich P. Conditioning of enamel with Nd:YAG and CO2 dental laser systems and with phosphoric acid. An in-vitro comparison of the tensile bond strength and the morphology of the enamel surface. J Orofac Orthop 2001; 62(5): 375-86. Walsh LJ, Abood D, Brockhurst PJ. Bonding of resin composite to carbon dioxide laser-modified human enamel. Dent Mater 1994; 10(3): 162-6. Goharkhay K, Schoop U, Wernisch J, Hartl S, De Moor R, Moritz A. Frequency doubled neodymium:yttrium-aluminum-garnet and diode laser-activated power bleaching--pH, environmental scanning electron microscopy, and colorimetric in vitro evaluations. Lasers Med Sci 2009; 24(3): 339-46. Marcondes M, Paranhos MP, Spohr AM, et al. The influence of the Nd:YAG laser bleaching on physical and mechanical properties of the dental enamel. J Biomed Mater Res B Appl Biomater 2009; 90(1): 388-95. Immerz I, Proff P, Roemer P, Reicheneder C, Faltermeier A. An investigation about the influence of bleaching on shear bond strength of orthodontic brackets and on enamel colour. ISRN Dent 2012; 2012: 375849. Perdigão J, Francci C, Swift EJ Jr, Ambrose WW, Lopes M. Ultra-morphological study of the interaction of dental adhesives with carbamide peroxide-bleached enamel. Am J Dent 1998; 11(6): 291-301. Spyrides GM, Perdigão J, Pagani C, Araújo MA, Spyrides SM. Effect of whitening agents on dentin bonding. J Esthet Dent 2000; 12(5): 264-70. Sung EC, Chan SM, Mito R, Caputo AA. Effect of carbamide peroxide bleaching on the shear bond strength of composite to dental bonding agent enhanced enamel. J Prosthet Dent 1999; 82(5): 595-9. Khoroushi M, Saneie T. Post-bleaching application of an antioxidant on dentin bond strength of three dental adhesives. Dent Res J (Isfahan) 2012; 9(1): 46-53. Khoroushi M, Aghelinejad S. Effect of post bleaching application of an antioxidant on enamel bond strength of three different adhesives. Med oral Pathol Oral. Cir Bucal 2011; 16(7): e990-6. Nokhbatolfoghahaie H, Chiniforush N, Sahabi S, Monzavi A. Scanning electron microscope (SEM) evaluation of tooth surface irradiated by different parameters of ER:YAG laser. J Laser Med Sci (Beheshti) 2012; 3(2): 51-5. Moritz A, Beer F, GoharKhay K, et al. Oral laser application. Berlin: Quintessenc Publishing Co 2006. Shahabi S, Brockhurst PJ, Walsh LJ. Effect of tooth-related factors on the shear bond strengths obtained with CO2 laser conditioning of enamel. Aust Dent J 1997; 42(2): 81-4. Walsh LJ, Abood D, Brockhurst PJ. Bonding of composite resin to carbon dioxide laser-etched human enamel. Dent Mater 1994; 10: 162-6. Mazaheri H, Khoroushi M, Shafiei E, Ghorbanipour R, Majdzade F. Bond strength of composite-resin and resin-modified glass ionomer to bleached enamel: delay bonding versus an antioxidant agent. Indian J Dent Res 2011; 22(3): 432-5. Dabas D, Patil AC, Uppin VM. Evaluation of the effect of concentration and duration of application of sodium ascorbate hydrogel on the bond strength of composite resin to bleached enamel. J Conserv Dent 2011; 14(4): 356-60. Bulut H, Kaya AD, Turkun M. Tensile bond strength of brackets after antioxidant treatment on bleached teeth. Eur J Orthod 2005; 27(5): 466-71. Danesh-Sani SA, Esmaili M. Effect of 10% sodium ascorbate hydrogel and delayed bonding on shear bond strength of composite resin and resin-modified glass ionomer to bleached enamel. J Conserv Dent 2011; 14(3): 241-6.